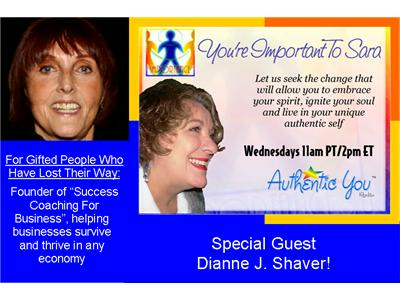 For Gifted People Who Have Lost Their Way with special guest Dianne J. Shaver! The only thing separating us from those who have achieved great things is the understanding that we matter. Our life matters. Our choices matter. What we focus on matters. What drives us matters. Our unique combination of gifts matters. What we have to give to the world matters. What we want from the bottom of our heart matters. The fact is we are ENOUGH just as we are. Not the we that has been conditioned or subsumed or molded, but the real, the authentic we underneath. When we understand that everything is possible. Without it nothing is possible or rather we will live a pale shadow of who we really are and life will never be full. It doesn’t matter if we want to own a bakery or design a dress, or write a hit screenplay, or help the homeless, or help the underprivileged in this and other countries, or become the next great dancer. Whatever our mission is it is important. There is no degree or order of importance. If we want it, it is important. There is no hierarchy. We will be discussing the importance of getting to that place where we can live our lives authentically and in purpose and in value of self.